Thai Pineapple Fried Rice. This is a great way to use up some leftover cooked rice in your fridge. Singaporean favourite dish straight from the restaurant and buffet menu. Crumble the cold rice between your fingers to separate the grains, and set aside. Add oil to hot wok and spread it around. Add the shallots, garlic, chillies and bell pepper and stir-fry until fragrant, about a minute. Add the beaten egg and scramble for a minute. Add in chicken stock, fish sauce, curry, turmeric powder and sugar and stir-fry. Add cashews and do a few quick stirs. Stir in rice, break up any lumps and stir-fry until rice is heated thoroughly, about 3 minutes. 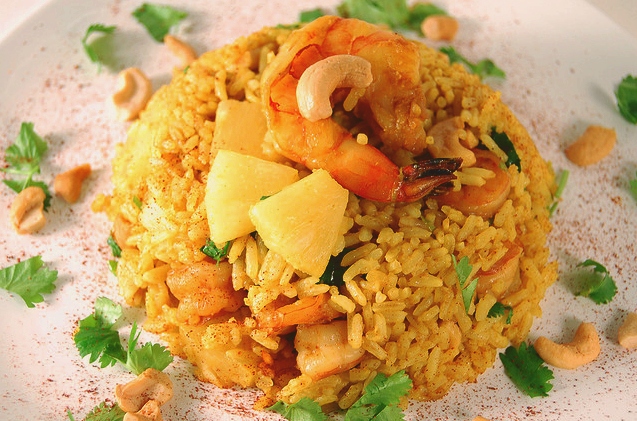 Add pineapple chunks, prawns, mix vegetables and raisins and stir-fry to mix them in. When all ingredients are properly and thoroughly mixed, dish up the rice onto a serving plate and garnished with chicken floss, chopped green onions and cilantro. Very good rice!! I made it using fresh pineapple and it turned out great. This had a light, sweet, spicy taste. Went great with chicken floss! do you have the recipe for chicken floss? thank you in advance! This was a pretty good recipe and quite easy.. Will make it again. interesting recipe blog you have here. nice layout and organized. keep it up! I have tasted fried rice many times but not pineapple fried rice. I am planning to try it during this weekend.